*phone rings* Hello? Yes, this is him. Mmmhmmm...ok.....uh....Y'know, I'm sorry, but I'm really busy right now,and I don't want to discusa deal where I write the screenplay for the Howard The Duck sequel. Mmmhmm...yeeeaaahhh...I don't really see that....uh, it pays how much? I'll have a 10 page treatment for you tomorrow! That my friends, is my dream in life. 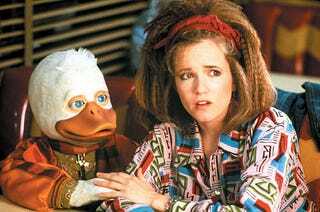 I would love for someone to pay me obscene gobs of money to write the sequel to Howard The Duck. Think about it; as far as screenplay writing goes, it's ideal. You get a lot of money to write a script for a movie that everyone expects to be horrible! How could you lose? And, if by some freak lunar congruence with Saturn where all the stars in the universe line up with the spot exactly equidistant between Hollywood and Rigel 7, and the movie turns out not exactly terrible, you could win an oscar! Really, it's not like you could make the sequel any worse than the original was. Look....I think I'm qualified to call Howard one of the worst movies of all time. I have a fondness for bad movies. I actually bought Ishtar on VHS because I didn't think it was that bad. The movies that most everyone pans are the ones I don't mind watching. And the ones everyone thinks are super-duper fantastic, I find unwatchable. Anyway, today is Monday, and that means MADE UP MONDAY!!!!! I'm about to tell you a tale, and you get to decide if it's true or false. Englands royal family are well known around the world. Regardless of your feelings about them, you could, most likely, recognize the queen, Chuck, Willie, Hank and Katie. In the past few years, we have seen more and more that the royals are just people, like us. Sure, they are royalty and get perks, but deep down, they are humans and such, have things the do that make them human. But one of the things that shows the humanity of the royals is the subject of todays post. Queen Elizabeth, like every other human, needs down time. More now that she is getting older. And one of her favorite ways to wind down is to lose herself in a movie. Like everyone, she has a favorite movie that she depends on when she really needs to relax. And her choice of movie is what todays post is about. Elizabeth and her husband, Phillip, will watch a wide variety of movies. And they will enjoy them. But, just as everyone does, the keep returning to that one movie that they have seen so many times, they have it memorized. They can watch the entire movie in their head. For Phillip, it's the Bogart/Bacall classic, Casablanca. And that's not too unusual, I guess. There's a lot of people from his generation that will also claim that Casablanca is one of their favorites. But, Phillip is only the prince consort. Elizabeth is the queen. And it's her favorite movie that takes the front seat when she needs to wind down. It's not a well know fact, as she almost seems embarrassed to talk about it. Her favorite ranks so high with her for many reasons. As she explained in an interview in early 2002, it's a movie that portrays a royal family as a victim against a democratically elected government. It has a small bit of action, but doesn't portray any death, and the violence it does have, is quite tame. It has just a touch of sexual tension, but no outright sexuality. It stars her favorite actor. And, probably most importantly, it has humor that is clean and doesn't rely on profanity to be funny. She calls it a whimsical farce that doesn't take it's self too seriously. The queen is a fan of all of Mel Brooks movies, in fact. Spaceballs is her favorite, but she also enjoys High Anxiety and Young Frankenstein on a regular basis. The queen estimated she had watched the movie about 6 times a year since it's release. So my homies and homettes, true or false? The queen: Spaceballs fan or not? I'll show up tomorrow and supply you the answer.